JAPAN: Hitachi will add a production line at its facility in east Japan to manufacture nacelles for its 5MW offshore turbine. The offshore market in Japan is expected to expand in the near future, and Hitachi wished to be prepared to meet demand, a spokesperson said to Windpower Monthly, explaining the expansion. The HTW5.0-126 production line will be added to the company's existing manufacturing facility in the Ibaraki prefecture, east Japan. 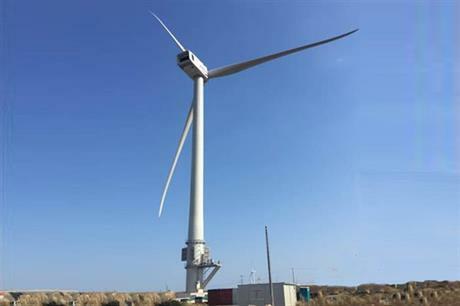 In March, Hitachi completed the construction of its 5MW downwind offshore turbine at a coastal site near Kashima city in Ibaraki. The model combines a medium-speed generator with permanent magnet drive and features a rotor diameter of 126 metres. The downwind model has been designed for typhoon-prone IEC-Class S (annual average wind speeds of 10m/s) locations, enabling it to withstand wind conditions typical in that region. In February, the developers of the 220MW Murakami offshore project in Niigata province chose Hitachi to supply the 5MW turbine for the development. The Japanese government has identified four other areas it will look at to possibly develop up to 1.45GW of wind projects. In partnership with the local governments, the ministry of environment will study an area off the coast of the Iwate prefecture in north-east Japan for a project of up to 200MW. It will also look at two sites off the coast of Kitakyushu in the Fukuoka prefecture in south-west Japan to install a total of 700MW. Infrastructure firm Toda Corp will assist with the study of two floating offshore projects off the coast of Nagasaki. The 22MW and 50MW projects could be located off the south-west coast near the island of Goto. Finally, SB Energy Co will join the study of a 30MW onshore project in the Tottori prefecture on the Japanese west coast.